A circadian rhythm is like your internal clock, designating when you feel more tired and when you feel more energized. Getting a good night’s rest allows these swings from high to low to be less intense while sleeping less can cause the cycle to consist of more intense shifts in energy. This internal cycle and the amount of sleep you get impacts all aspects of your life, and, as we now know, on the performance of football players. But NFL players aren’t the only athletes who benefit from good sleep. Plenty of NBA players count on sleep to help their performance, too. 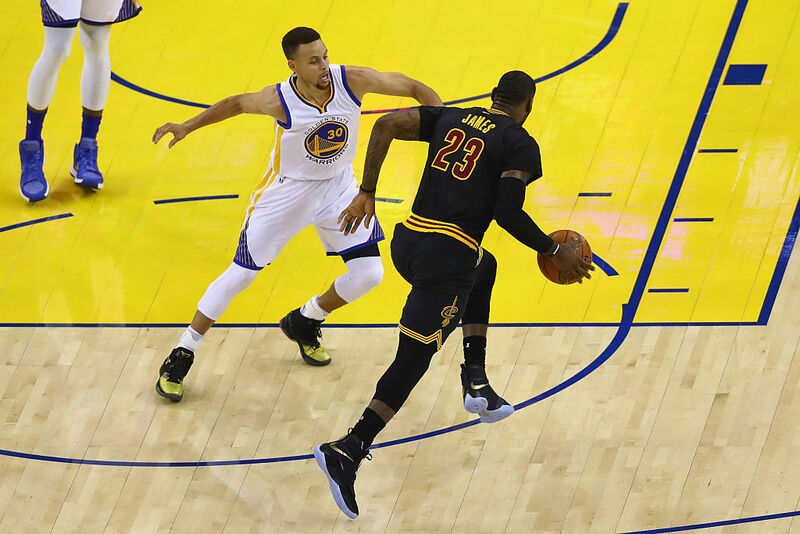 In anticipation of Game 3 of the NBA finals tonight, we looked to some of our favorite basketball players to talk about how sleep affects their performance. 1. Andre Iguodala: Sleep good, feel good, play good. The Golden State Warriors’ Andre Iguodala, a member of the Thrive advisory board, spoke with Thrive Global founder and CEO Arianna Huffington in the Thrive Global Podcast about how prioritizing sleep completely shifted his performance. Nine years into his career in the NBA, Iguodala met with a sleep therapist to get rid of the bad habits he adopted in college. “I’ve tried to perfect everything that goes on in the game of basketball that can make me a better player,” Iguodala told Huffington. “I’m looking to better in every area. Sleep was one of those areas.” Since adjusting his sleep schedule to get eight hours per night, Iguodala saw an increase in playing time and points per minute, and a significant decrease in turnovers and fouls made. 2. Lebron James: There’s no better recovery than sleep. The Cleveland Cavaliers’ Lebron James told CBS Sports that while players’ travel schedules can seem to limit their opportunities for sleep, getting quality rest is key in post-game and practice recuperation. “Sleep is the most important thing when it comes to recovery,” he said. With an average of 27.5 points and 9.1 assists per game this season, James also tries to average 12 hours a sleep a night. 3. Kevin Durant: You have to fine-tune your body. The Warriors’ Kevin Durant attests that as a professional athlete, perfecting your health is as important as fine-tuning your basketball skills. “There are a lot of remedies you can use as a basketball player to get better, but the easiest thing you can do is go to sleep,” he says. Durant reports that sleep has been an essential part of his mission of constant improvement. “Every day is a new chance to challenge myself and push my training to the next level, but I can only do that if I keep my energy up. Sleep is an important part of that,” he tells the Huffington Post. 4. Kobe Bryant: You can’t perform on 2-3 hours of sleep. In a Thrive e-Course, guest lecturer and former Los Angeles Lakers star Kobe Bryant highlighted the importance of a good night’s sleep. Bryant did not realize how much sleep impacted his performance until midway through his professional career. “My sleep habits were horrendous,” Bryant recounts, “I was feeling sluggish. I was feeling lethargic, and I knew it wasn’t because of my training.” Bryant seriously evaluated his sleep schedule and made dramatic changes in order to reach his peak potential. Through these alterations, he discovered that sleep and productivity go hand-in-hand.